When my oldest son deployed in 2012 I began to see the larger network of The Citadel in action. A friend at church, Col. William Buckley, USMC (ret) introduced me via email to a friend of his from his days as a cadet at The Citadel, LTC Walter “Wally” McTernan, USMC (ret), Citadel class of 1972. Wally, as I’ve come to call him, was, and still is, in Afghanistan as a contractor. While my son was deployed Wally looped me into correspondence with a wide array of Citadel graduates. I sent care packages to some with the help of friends from church Citadel parents, military reporters, and others. Thanks to Wally I learned helpful advice of what to send deployed service members. Things like Saran wrap that could be used to stop bleeding in the field. I learned how broad reaching The Citadel network really is, even including the clueless mom of a graduate. I also learned that Wally is a great story-teller and organizer. He coordinates the alumni in country for an annual Muster to honor the fallen graduates. He was recognized by the Citadel Alumni Association for his volunteer work in 2014 being named the 2014 Distinguished Alumnus of the Year. I also learned of his love of Crystal Light Peach tea. My son is out of the Army now and working in his new career based in Houston. Wally and I continue to correspond. With the news of the Summerall Guards and the Regimental Band and Pipes marching in the inauguration parade in January Wally’s latest email tells the story of his experience in participating in the Cherry Blossom Festival parade in 1972 and another story of the inauguration of President George Bush in 1989. I am sharing his story it here with his permission. “The 1972 Summerall Guards marched in the Cherry Blossom Festival parade in WDC in early April 1971. Luckily for me I was in position 1A1 (first squad leader, front rank) – because we were marching behind a mounted unit, and there were a lot of “horse apple IED’s” on the road. So I was luckily able to adroitly avoid stepping on/in them. Of course, keeping established discipline, I did not say anything. I chuckled inside every time I heard a softly muttered “shxt” by someone in a follow-on rank who haplessly “stepped in it” (literally). After the parade, I noticed the stark visual contrast in color between horse shxt brown and starched cadet FD trou white. Mrs. Bennett was expecting and was not feeling well, so we departed the Inauguration Ceremony early; got in the VIP sedan awaiting us behind the Capitol, and began to depart the area. 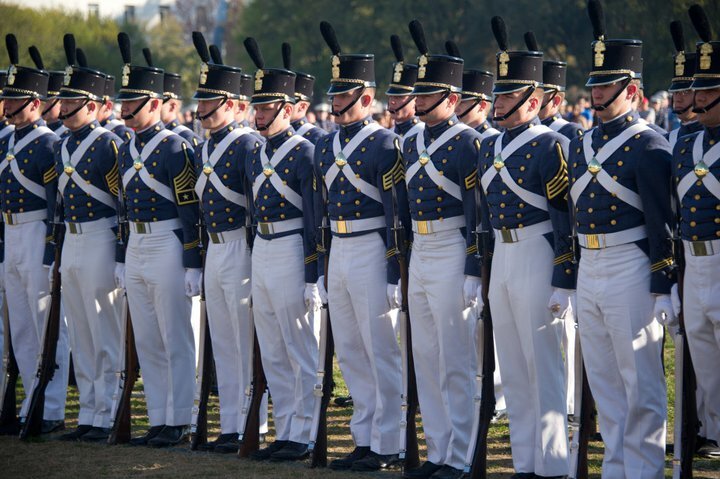 We drove past a contingent of Cid cadets forming up to march down Pennsylvania Avenue in the parade. Dr. Bennett recognized them as Citadel cadets and commented that the phrase “zero tolerance” (of illegal drug abuse) that he used was a phrase he had borrowed from the late and great MG James Grimsley, USA (Ret.) ’42. Dr. B. said that he had given a greater issues speech at The Citadel, and he had asked the General what was his policy on drug abuse. MG Grimsley replied, “zero tolerance.” Dr. Bennett said that phrase really resonated within him and he used it ever since. Mrs. Bennett commented that a close family friend of hers while growing up was Dr. Ira Rapp (Regimental CO ’70). Mrs. B. and Ira’s sister were best friends growing up. That night I escorted the Bennet’s to dinner at a fancy WDC restaurant before taking them to an Inaugural Ball. I waited for them in the lobby. I was approached by the late political humor columnist, Art Buchwald, who had given Greater Issue speeches twice at The Citadel, one of which I saw when I was a cadet. Mr. Buchwald was a Marine in WW-II, so when he saw a Marine officer, he came up to chat amiably. He was very funny and unpretentious. While we were chatting, a gentleman came up to speak to Mr. Buchwald. Art was clearly continuing to chat with me just to keep this guy waiting. While impatiently waiting, the poor (figuratively, NOT literally) guy was accosted by a couple of society matrons who hit him up for a donation to their favorite charity. This fellow was one Mr. Donald Trump, whose own Inauguration we will soon celebrate. Thus bringing the 2017 SG’s and our world-class Band Company to WDC.